JUnit is considered the standard unit testing framework to test Java applications. Now days every IDE comes with the inbuilt support of JUnit, For this Junit Mockito Tutorial we will be using JUnit 5 and Eclipse Oxygen version. 1. Annotations reside in the org.junit.jupiter.api package. 2. Assertions reside in org.junit.jupiter.api.Assertions. 3. Assumptions reside in org.junit.jupiter.api.Assumptions. 4. @Before and @After no longer exist; use @BeforeEach and @AfterEach instead. 5. @BeforeClass and @AfterClass no longer exist; use @BeforeAll and @AfterAll instead. 6. @Ignore no longer exists: use @Disabled instead. 7. @Category no longer exists; use @Tag instead. 8. @RunWith no longer exists; superseded by @ExtendWith. 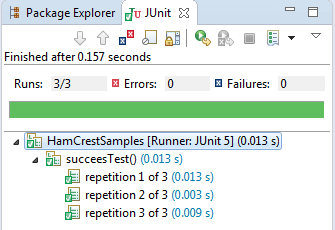 JUnit provides may annotations, we have explained them below based on the usage, Neither test classes nor test methods need to be public in Junit 5. Methods annotated with @Test, @TestTemplate, @RepeatedTest, @BeforeAll, @AfterAll, @BeforeEach, or @AfterEach annotations must not return a value, So always the return type of the method shoud be void. @Test is the actual test method where we place our code to test the applications. @Disabled annotation used to tell the compiler that method should not be executes, @Disabled makes the method to skip. In JUnit 5 all the assertions are present at org.junit.jupiter.api.Assertions and all the assertions methods are static. fail() method fails the current 2test test case without checking for any conditions, this method will be useful incase where you have to fail a test case when an particular exception occurs. assertTrue method verifies whether given parameter is true/results in true or not, in case if the parameter is false then assertTrue method fails the testcase. We can also mention the reason for failure. assertFalse method verifies whether given parameter is false/results in false or not, in case if the parameter is true then assertFalse method fails the testcase. We can also mention the reason for failure. verifies whether given object is null or not, in case if the object is not null then Junit fails the test case. verifies whether given object is not null or not, in case if the object is null then Junit fails the test case. assertEquals method compares whether two give values are same or not, if the values are diffrent then Junit fails the testcase. This method is overloaded to accept all kind of values, from Byte to Object class. assertArrayEquals method compares two given arrays, fails incase both arrays are different. This method is also overloaded to accept all the values in java. assertIterableEquals method verifies whether given iterable are same are not, below example shos that same values stored in ArrayList and LinkedList, even though those are two different object, this method verifies whether values are in matching order or not. assertNotEquals method verifies given two object and fails if both object are same, assertNotEquals method is also overloaded to accept all the values in java. assertAll method verifies all the assertions passed to this method. assertThrows method verfies whether given code throws exception or not, Junit fails the testcase incase if no exception occurs. assertTimeout method asserts that execution of the supplied executable code completes before the given timeout is exceeded. 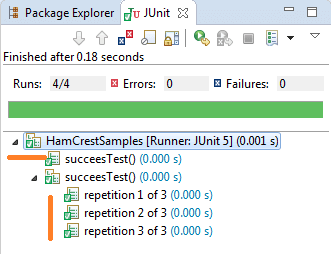 Even though the assertion facilities provided by JUnit Jupiter are sufficient for many testing scenarios, there are times when more power and additional functionality such as matchers are desired or required. Till JUnit 4 developers were using assertThat() method present in the org.junit.Assert class but Junit 5 onwards Hamcrest provides its own assertThat() method. Hamcrest allows checking for conditions in your code using matchers classes present hamcrest API. Using hamcrest matchers we can compare two values are same or not, using equalTo, is methods. To get the same result as above wwe can use the Junit's assertEquals method. containsString method verifies whether Main string contains substring or not. In Junit we can tag a test using @Tag annotation, @Tag helps to identify a test. We can execute and filter the test based on the tages that we provide. Tagging similar to groups in TestNG, for Example if we wat to run only 'smoke' tests we can tag test which we want to execute as part of smoke test. Test classes and methods can be tagged via the @Tag annotation. @Tag names should follow below conventions. 1. A tag must not be null or blank. 3. Tag must not contain ISO control characters. @ParameterizedTest annotation allows user to achieve Parameterization, Parameterization is nothing but testing a method / test using multople data. Parameterized tests make it possible to run a test multiple times with different arguments. @EnumSource helps the user to read the data from the Enum, this annotation reads all the data from the Enum. We can also fetch only few values from the Enum instead of complete values. We have to set the names parameter as the values that we want to retrieve from the Enum. Output of @EnumSource with few values. @MethodSource allows you to refer to one or more factory methods of the test class. Such methods must return a Stream, Iterable, Iterator, or array of arguments. In addition, such methods must not accept any arguments. By default such methods must be static unless the test class is annotated with @TestInstance(Lifecycle.PER_CLASS). If you do not explicitly provide a factory method name via @MethodSource, JUnit Jupiter will search for a factory method that has the same name as the current @ParameterizedTest method by convention. Note : This method is still in development mode so it will not work, When I was writing this tutorial. below method didnot work. @CsvSource annotations allows user to read from the Comma seprated values as parameter (not as .csv file), With CSV values we can read more than one parameter and as different data type parameter. In below example we are reading the String and int value. 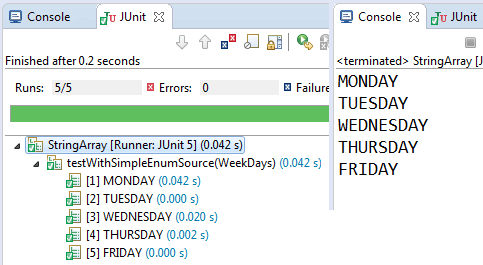 Below table explains what happens when the Junit parses the CSV values. @CsvFileSource lets the user to read the data from the csv file rather than reading from program. Each line from a CSV file results in one invocation of the parameterized test.